A song in the heart plus a song in the brain can bring good moods and health for years to come! Music is an important part of life for most people. But did you know it actually gives our minds a workout? Or that it can promote healthy aging? Each year, more is learned about the powers of music and its physical, mental, spiritual and emotional benefits. So, what are the benefits of music and how can older adults use it to help maintain their health? Music is one of the few activities that uses both sides of the brain at once, particularly if you play an instrument or sing. Since using the whole brain maximizes learning retention, musical training has been shown to help older adults maximize brain function. This is one reason music is integrated into Grace Ridge’s ongoing education program with curriculums like “How to Listen & Understand Great Music.” Regular rehearsals also keep our musical groups sharp – there’s even a ukulele club! Did you know listening to joyful music can increase blood flow? It can also be an effective distraction from pain and even reduce fatigue. One of the best examples of how music supports total wellness is our Conductorcise® program. 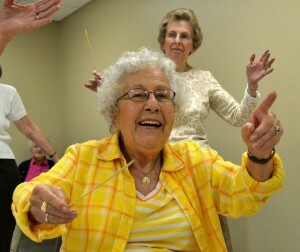 Grace Ridge is the ONLY continuing care retirement community (CCRC) in N.C. certified in Conductorcise®, which combines an upper body workout with a music lesson. It’s been known to tone resident smiling muscles as well! Why is music behind so many good moods? For one, it has the ability to bring people together. This can result in feelings of togetherness and unity not unlike faith congregations. And some studies show music is as effective as a massage in reducing anxiety and stress. 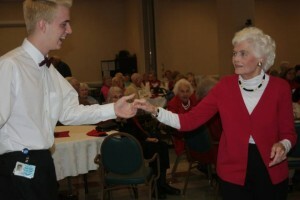 CCRCs like Grace Ridge connect seniors with opportunities to enjoy music. From special performances at CoMMA to in-house concerts, it can be hard to resist the urge to smile – or dance! All in all, we believe total health encompasses mind, body and mood. And since music has such a positive impact on all three, naturally it’s an integral part of our Good Moods wellness program and our overall lifestyle. Lift your mood with an afternoon of soaring sounds! On March 25, join us for a special performance by the renowned Kaia Quartet. As the Western Piedmont Symphony’s resident quartet, the foursome will have your spirits soaring with their passion and exploration of musical cultures, particularly Latin America.